Check out Linda Tucker’s video above which was made for the NYC Fashion show from footage of the White Lions brought to you by Brad Laughlin.The sublime musical track, “Children of the Sun” is thanks to U.K. composer David Chabeaux, who has generously donated this composition to the White Lion cause. Thank you so much for the enchanting song. An enormous thank you to Adrian Alicea for putting on such a fabulous show. Also a big thank you to Carol Pepper, our New York based asset manager, for introducing us to Adrian. Last, but certainly not least, extreme gratitude to Joanna May and David Ladd for, not only participating in the Fashion Show, but also helping the Trust raise awareness and money to help protect White Lions! Check out Joanna May’s pictures below showing how she lit up the Fashion Show in NYC. Joanna definitely has a second career she can easily fall back on! Pictures below are courtesy of Ral Photographie. The full set of fashion show pictures can be see on Ral Photographie’s Site. Not only was the fashion show a success but over $1,000 U.S dollars were raised to help our White Lions! Joanna May’s, The “Spirit of the White Lions” and “Majesty”, paintings you see highlighted in the pictures below were both sold at the Fashion show. 20% of the proceeds were donated to the White Lions! Joanna May also helped to raise a little over $800 U.S dollars by taking the “White Lion” challenge and walking the runway. Head over to Washington Square News for a Review. Joanna May Beautifully Highlights the “Spirit of the White Lions” Painting. 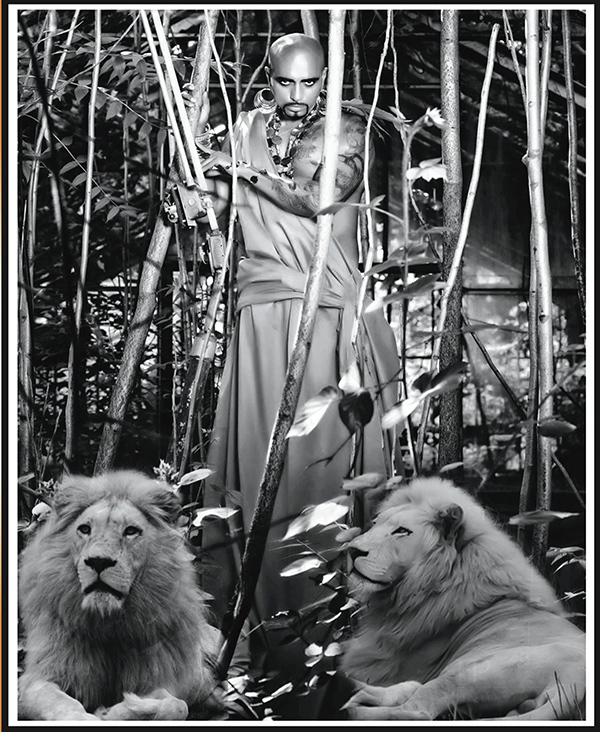 Sept 12th – Catwalk Event In NYC Fashion Week – Supports WHITE LION Conservation! Some good news to lighten our hearts in our tireless campaign for the survival of the last White Lions in the wilds of their natural endemic habitat! This September 12th, 2013 fashion designer Adrian Alicea has committed to support our cause during his runway show in New York’s fabled fashion week. Building: New York’s Hotel Pennsylvania — Pen Top Ballroom (18th Floor). Ticket Prices: $35 for General Admission / $50 for second row seating / $100 for V.I.P. Born in the rain forest outside Puerto Rico, Adrian Alicea is an avid animal lover and long-standing vegan. His support will be a trail-blazer, setting the trend for the high fashion scene to STEP-UP and take a responsible stand towards today’s environmental crises. Drawing attention to the White Lion Trust’s urgent conservation imperatives, Adrian Alicea’s spectacular designs WILL ONLY USE IMAGES OF WHITE LIONS THAT ARE ALIVE AND FREE IN THEIR WILD ENDEMIC HABITAT. However, there is also an opportunity to support from the crowd with tickets starting at $35! CLICK HERE for admission details and ticket prices for attending in the crowd! White Lion Statistic this event is helping minimize!